THE GENESEE 135 InnovativeHealthMag.com the delightfully retro Capital Theater around the corner; the old printing plant that now houses the new Farmer’s Market. Charming reminders of bygone times? Nothing is as traditional as the stretch of cobblestones along Saginaw Street, where streetcars once ran and where cars now can still rattle a bit. But stone and cement can seem cold, too. That is the first impression of many people when they approach the Genesee County Courthouse. Solid and solemn. Its exterior is nothing but granite and limestone. Official, serious and no-nonsense. Maybe courthouses and civic offices should present that image. However, in the middle of the Genesee County Courthouse is a metaphorical heart that beats as warmly and humanly as you could imagine. It is a remarkable courtroom where compassion and humor, justice and understanding reign. The Mental Health Court of Judge Jennie Barkey is unique in Michigan, and a model for similar courts—and similar approaches to justice and rehabilitation—around the nation. 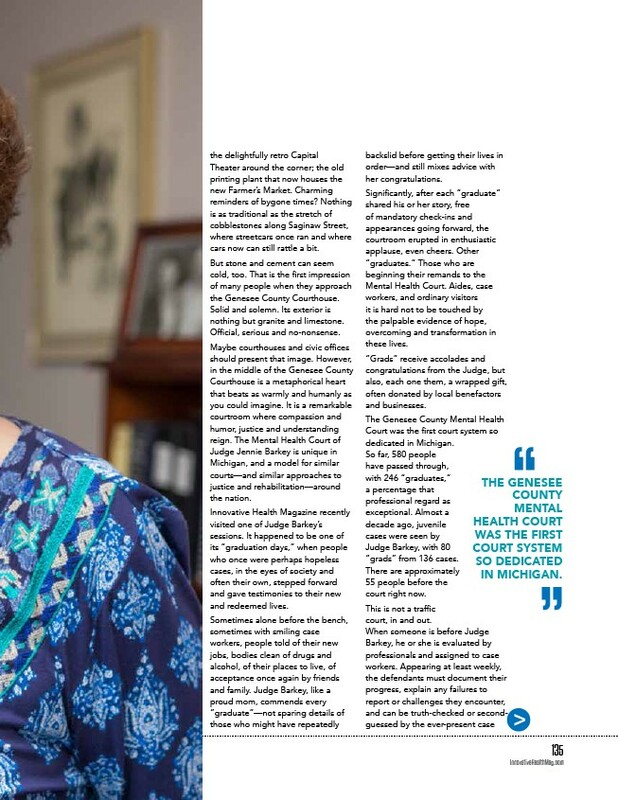 Innovative Health Magazine recently visited one of Judge Barkey’s sessions. It happened to be one of its “graduation days,” when people who once were perhaps hopeless cases, in the eyes of society and often their own, stepped forward and gave testimonies to their new and redeemed lives. Sometimes alone before the bench, sometimes with smiling case workers, people told of their new jobs, bodies clean of drugs and alcohol, of their places to live, of acceptance once again by friends and family. Judge Barkey, like a proud mom, commends every “graduate”—not sparing details of those who might have repeatedly backslid before getting their lives in order—and still mixes advice with her congratulations. Significantly, after each “graduate” shared his or her story, free of mandatory check-ins and appearances going forward, the courtroom erupted in enthusiastic applause, even cheers. Other “graduates.” Those who are beginning their remands to the Mental Health Court. Aides, case workers, and ordinary visitors it is hard not to be touched by the palpable evidence of hope, overcoming and transformation in these lives. “Grads” receive accolades and congratulations from the Judge, but also, each one them, a wrapped gift, often donated by local benefactors and businesses. The Genesee County Mental Health Court was the first court system so dedicated in Michigan. So far, 580 people have passed through, with 246 “graduates,” a percentage that professional regard as exceptional. Almost a decade ago, juvenile cases were seen by Judge Barkey, with 80 “grads” from 136 cases. There are approximately 55 people before the court right now. This is not a traffic court, in and out. When someone is before Judge Barkey, he or she is evaluated by professionals and assigned to case workers. Appearing at least weekly, the defendants must document their progress, explain any failures to report or challenges they encounter, and can be truth-checked or secondguessed by the ever-present case COUNTY MENTAL HEALTH COURT WAS THE FIRST COURT SYSTEM SO DEDICATED IN MICHIGAN.